Each month, we'll be highlighting different Southwest Airlines destinations at the Southwest Porch with special concerts, local brews, music and other exciting aspects of the cities. Chicago kicks off for May with a blues concert to celebrate. 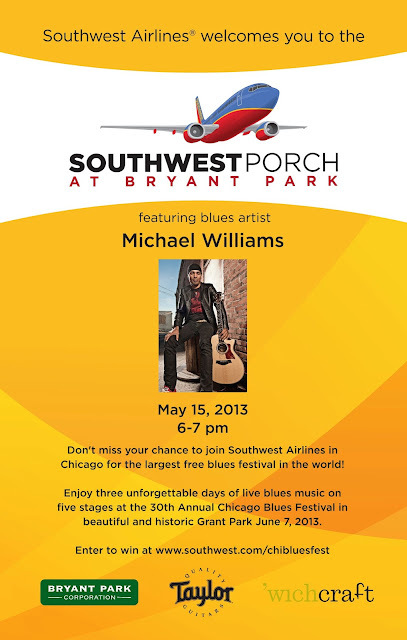 Come enjoy singer-songwriter and guitarist Michael Williams tomorrow night live at the Southwest Porch. Just a taste of what's in store next month in the Windy City at the Chicago Blues Festival. And remember, Southwest Airlines can take you there with daily non-stop flights from LaGuardia, Newark and Long Island to Chicago's Midway Airport. Don't miss your chance to join Southwest Airlines in Chicago for the largest free blues festival in the world! Enjoy three unforgettable days of live blues music on five stages at the 30th Annual Chicago Blues Festival in beautiful and historic Grant Park June 7-9, 2013. Enter for your chance to win now. This good news for business travellers! A service like this is stress-free and comfortable.